Jars come in really handy for cute storage places so every now and then I'll rescue some before they're thrown in the bottle bank. •You can use any type of jar or glass bottle. After you've used a sauce jar (or something like that) give it a steep in hot water, this should bring off any labels. Even if you feel uncomfortable with using glass storage you can use any kind of cup-like container. •I used Chalk board stickers that I managed to get hold of from The Range but if you can't them you could print out some label shaped templates and buy some black matte paint. •Obviously, you'll need chalk. My white chalk came with the stickers but I'd quite like to get some coloured chalk for different labels. •I decorated this with decorative tape. You can use stickers, paint, ribbon and anything that fits the theme. 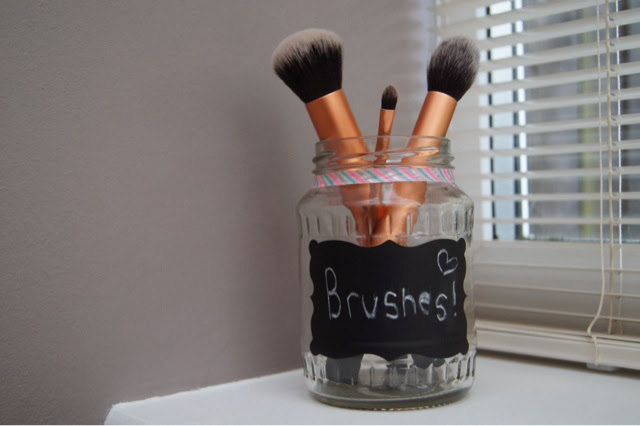 •I used this jar as a temporary brush holder so I wrote 'brushes!' on the label. You can use this for anything such as a nail polish holder, food container, ect. You can even wipe away the previous word on the label and replace it with something else. Easy-peasy huh? There's no limits with chalk labeled containers, you can go as crazy as you want. If you make any yourself, I hope they're fantastic! !